Insider Secrets of Public Speaking Book Launch - Kings Place London October 2014 | Nadine Dereza is an award winning journalist, experienced business presenter, conference host and co-author of 'Insider Secrets of Public Speaking'. | Nadine Dereza is an award winning journalist, experienced business presenter, conference host and co-author of 'Insider Secrets of Public Speaking'. This serious-minded and business-oriented blog may be your first port of call for thoughtful discourse on the current trends in communications and public affairs, but that doesn’t mean we don’t know how to let our hair down, and this week, we had a great reason to do so. 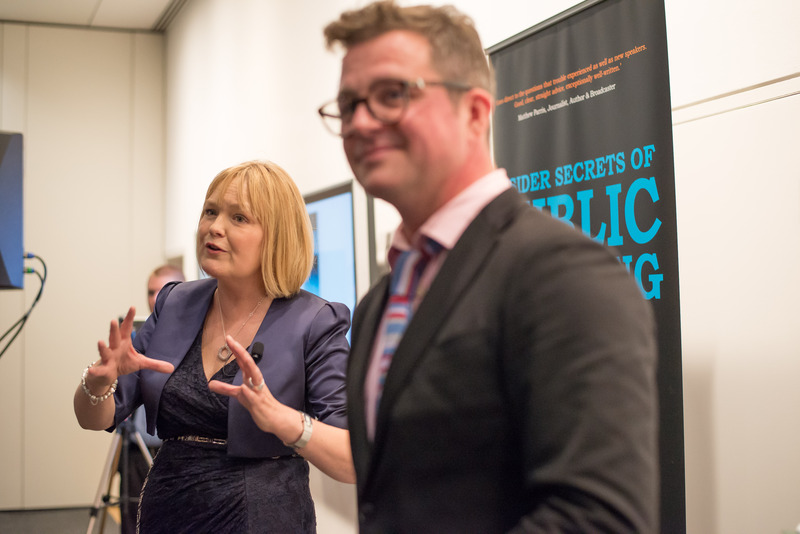 ‘Insider Secrets of Public Speaking’ is officially out – and we had the party to prove it! Authors Nadine and Ian descended early on Kings Place to set up The Battlebridge Room, a beautiful room overlooking the Regents Canal. Aided and abetted by our PR guru Tom York and friend Katherine Eyres (whose can-do attitude was the perfect match to our couldn’t-do reality) we had the books artfully stacked, the film crew briefed, and the pull-up banners, er, pulled up. With everything in place, we then had that terrifying moment of eyeing the dozens of wine glasses being methodically filled by a bartender and hoping that people would show up to drink them. By the end of the hour, the concern about getting through the wine was overtaken by the concern of getting around to say hello to everyone, which of course we couldn’t. The best view in the room was from the stage: family and friends and colleagues and clients all gathered together to launch the book, and this contrived metaphor was all the excuse (if excuse be needed) for getting rising stars on the comedy circuit, Jollyboat, to kick off the evening with bare chested songs of a piratical bent. Nadine and Ian took questions from the audience about public speaking, and we answered them by taking on board our own advice, and concentrating on our ‘Three Golden Principles’ that have formed the basis of all the tips we give in the book. And if book sales are an indication of how the Q&A went, we were on the right track. Learning outcomes: you can get a laugh from an audience by mentioning the words ‘deficit’ and ‘Ed Miliband’ in the same sentence, and Ian, armed with a roving microphone, makes a reasonable substitute for Anneka Rice in her Treasure Hunt heyday. Nadine’s son, James, demonstrated that beneath the cherubic eight-year-old exterior lurks a fledgling Alan Sugar, whose sales pitch – ‘Buy the hardback, it’s more expensive!’ – worked like a charm. At the end of the night, we were delighted to pack the car with considerably fewer copies of ‘Insider Secrets’ than we brought to Kings Place. So what happens now? The PR juggernaut continues with Ian guest speaking at networking events over the weekend and Nadine booked to appear on Radio 4’s Woman’s Hour this coming Wednesday. If you’d like to be part of the journey of making ‘Insider Secrets of Public Speaking’ less of a secret, then follow Nadine (@NadineDereza) and Ian (@SmartMrHawkins) on Twitter for the latest news and updates and join in the conversation using the #ISOPS hashtag. If you know of (or find yourself watching) a speaker who you think could use some pointers, a recommendation of the book will be much appreciated. It could be the perfect Christmas present for the colleague, friend or prospective Best Man/Woman in your life. Finally, we think ‘Insider Secrets of Public Speaking’ is good enough to earn a place on the shelves of every library in the country. Putting in a request at your nearest school, college or local library, will cost nothing, but will help inspire and nurture the employees and leaders of the future. Copyright © 2018 Nadine Dereza - All Rights Reserved.